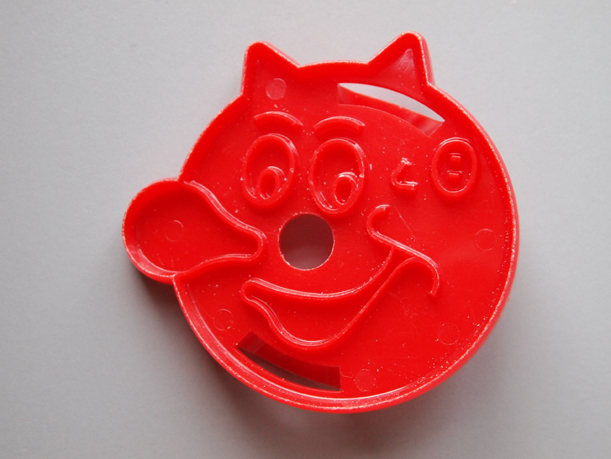 Reddy Kilowatt cookie cutter from the Morrison County Historical Society collection. Photo by Ann Marie Johnson. Reddy Kilowatt, that energetic icon of benevolent electricity, lingers in the psyche of Americans across generations. Created in 1926 by Ashton B. Collins, Sr., the commercial manager for the Alabama Power Company, the long-limbed happy-go-lucky cartoon character was used to promote the relatively new power of electricity. Consisting of a body and limbs made from lightning bolts with a light bulb for a nose and wall outlets for ears, Reddy’s popularity led to his syndication and licensed use by over 150 public utilities and at least twelve foreign countries. Among the licensees was Minnesota Power & Light (MP&L), now Minnesota Power, which had acquired the Little Falls Water Power Company and Royalton Power & Light Company in 1924. Minnesota Power currently serves customers in the northeastern quarter of Minnesota, including much of Morrison County. Reddy Kilowatt was created as part of a campaign to humanize electricity and sell the benefits of cheap, clean, helpful, ready power to the waiting consumer. Companies such as MP&L became subscribers to the Reddy Kilowatt “mat service” which from the 1930s until the late 1960s provided sheets of advertising clip art showing Reddy in a variety of poses. The idea for the character reportedly came when Collins was driving home from an industry convention during a lightning-filled thunderstorm. The character he dreamed up has been used in a wide variety of advertising and promotional circulars and has appeared as everything from nightlights and cookie cutters to huge lighted signs and three-dimensional stuffed figures. Reddy was even featured in a 1947 comic book (“Reddy Kilowatt in Reddy Made Magic – The Amazing True Story of Electricity”) and a movie of the same name that was produced one year earlier by the studio of Walter Lantz. In 1959, the same movie was updated to create a new film, “The Mighty Atom”. This film included much of the old footage with the addition of a new sequence promoting the use of atomic energy. 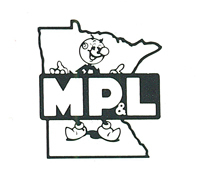 Minnesota Power & Light company symbol featuring Reddy Kilowatt, from “Changing With the Times,” a Minnesota Power brochure, 1987. Minnesota Power. 2012. Allete, Inc. 9 October 2012 http://www.mnpower.com/. Minnesota Power & Light, Business & Industry Collection. Morrison County Historical Society, Little Falls, MN. National Museum of American History. Smithsonian. 29 August 2012 http://americanhistory.si.edu/collections. O’Donnell, Arthur. “The Guilty Environmentalist: Resurrecting Reddy Kilowatt.” The Energy Overseer. 2012. 29 August 2012 http://www.energyoverseer.com/WebPDFs/REDDY.pdf. REDDYKILOWATT.ORG. 29 August 2012 http://www.reddykilowatt.org/. Lantz-o-Pedia. 2010. Misce-Looney-Ous Blog. 19 September 2012 http://www.lantz.goldenagecartoons.com/misc/. This article originally appeared in the Morrison County Historical Society newsletter, Volume 25, Number 3, 2012.